Three U.S. Army Special Forces soldiers were killed and two wounded in joint operations with local forces in Niger, marking the first American combat casualties in the West African nation. 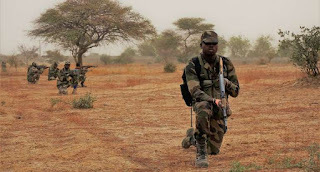 The forces were ambushed on a Wednesday night routine patrol in southwest Niger; Radio France International reported that militants set a trap for the soldiers after an operation was launched in response to an attack on Tillabéri by fighters coming from Mali. Five Nigerien soldiers were killed, as well. U.S. Africa Command confirmed "a joint U.S. and Nigerien patrol came under hostile fire," adding they would release more details as they become available. "U.S. Forces are in Niger to provide training and security assistance to the Nigerien Armed Forces, including support for intelligence, surveillance and reconnaissance (ISR) efforts, in their efforts to target violent extremist organizations in the region," the AFRICOM statement added. "One aspect of that is training, advising and assisting the Nigeriens in order to increase their ability to bring stability and security to their people." While no group has yet claimed responsibility for the attack, forces loyal to both al-Qaeda and ISIS (Islamic State in the Greater Sahara, or ISGS) operate in the region and have attacked Niger in the recent past. The Group for the Support of Islam and Muslims, an umbrella coalition established in March of al-Qaeda loyal groups in Mali including the local branch of al-Qaeda in the Islamic Maghreb, was seen as a shrewd alliance that cemented al-Qaeda as the dominant jihadist force in the region. In March, Niger declared a state of emergency due to the Mali border threat; this was extended last month. Niger announced offensive operations in Tillabéri this June. After Air Force One landed Wednesday night, returning from Las Vegas, White House press secretary Sarah Huckabee Sanders told the press corps that President Trump had been briefed on Niger.